Last days of this fabulous trip. Actually I’m writing from home cause I hadn’t had time while I was still in Boise, three days ago. 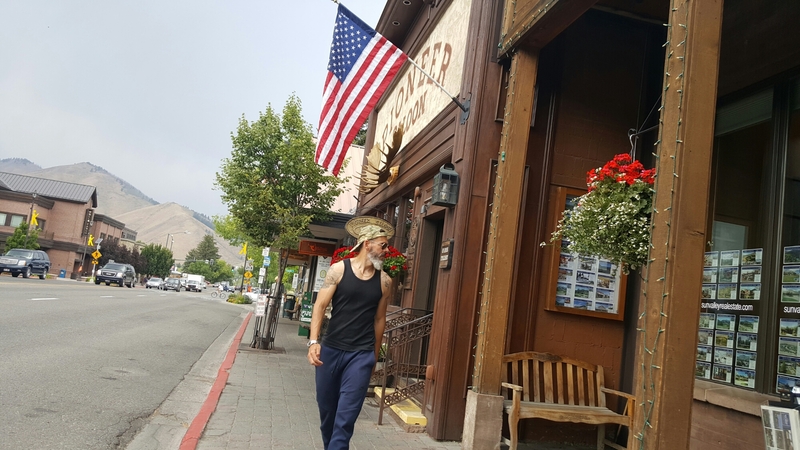 Now the vacation is over, but I still have in mind those three days spent in one of the nicest little town I’ve ever been, Ketchum, Idaho. Honestly I have to say I didn’t know the town existed until I did some research while I was planning for this trip. So I came to know of the Sun Valley, a beautiful valley in the Rocky Mountains in Idaho. Apparently the town is pretty famous as one of the best places for skiing in winter. It certainly looks beautiful in summer, that I can say. I spent two nights in a great lodge right in the city center. I rested as I had planned before, since I was coming from 6 days in a row camping, and had the opportunity to ride my bike in a town very bike friendly. A lot of bike lanes and more bike shops than restaurants. About my last day in Boise instead, I have to say I wasn’t particularly struck by the city. But I guess it was just me, since my mood wasn’t really up. It was the last day of a wonderful trip and I’ve never liked goodbyes. I’m thinking the city has a lot to offer, since it’s completely surrounded by forests rivers and lakes. That said, I just wanted to say that I can’t even try to explain how magical this travel has been, and I wanted to thank everyone who’s followed me all along this trip, watching my videos, commenting my posts and reading the blog. Thank you everybody, I’ll talk to you soon, in the meantime, if you get the chance, go see the American National Parks. You’re going to have the time of your life. All right. Looks like I’m leaving again. Although I get to travel a bit during the year, it’s usually in August that I get the longest period off work, hence my chance to organize a real trip. And that’s what I did. It took me two months of endless sessions on the Internet to plan every detail, but eventually I got it all figured out and planned. I’m heading West again. United States. Many of you might already know it’s not going to be my first time in the US, I’ve been there many times in the last few years. I love the US and that love got me to see all the main American big cities, from East to West, and some of the beautiful big National Parks, touching about 20 States and counting. And now I’m about to start a new road trip, which is the kind of trip I love the most. I’m going to cover 3500 km in 3 weeks, starting from Denver, Colorado, and ending in Boise, Idaho. I already had more than a road trip across the US, and I covered that kind of distance just last year, so I know pretty well how to do it, and I know I can do it all by myself. This time though, it’s gonna be a real challenge. I’m going to see many of the main Parks all across Colorado and Utah, then I’m gonna head North, to the Yellowstone National Park, then West to the Sun Valley, Idaho. And the thing is, this time, I’m going to spend some nights camping inside the Parks. The idea was, it should be awesome waking up, say on the edge of the Bryce Canyon, looking at the sun coming up its crests. Or in the middle of Yellowstone, hoping it’s not a grizzly that’s waking you up, calling for breakfast. It sounded amazing so I planned it this way. As a result, now I got I don’t even know how many reservations between hostels, motels, a 4 stars hotel in seven different campgrounds. I don’t even have a tent yet, go figure. That’s why it’s gonna be challenging, but I’m very willing to do it. So, it’s with this kind of spirit that I’m leaving. I’m not going to bother you with every detail of the plan right now, but I’m gonna try to keep you posted on a daily basis, with pictures and videos, though it might get complicated along the way ’cause I’m pretty sure it’s gonna be hard to get Internet connection everywhere I’ll go. But you’ll definitely hear from me, and hopefully I’ll be able to make you live a part of this trip with me. Meanwhile, feel free to share any suggestion. Take it easy you guys. Orange You Glad I Made It Again? LG Studio - Foto di Viaggio e per passione. I'm an Atypical Italian Traveler, born and raised in Rome. Here to tell you my travel stories, give you some tips, and try to make you laugh. Leave your Email address to follow this blog and receive notifications of new posts by email. Non tornare come sei partito. Torna diverso. Prima o poi torno...ma intanto vado!! Racconti fotografici di viaggio. Esperienze, impressioni, itinerari e consigli per sognare un po'.